Is Brooklyn barbecue taking over the world? In the article, the author shares his story of visiting a barbecue restaurant in Barcelona, only to learn the inspiration came from a place in New York called Fette Sau. Of course, the topic of barbecue is a sensitive subject for many people. Everyone has their barbecue preferences, from North Carolina’s vinegar style to Kansas City’s molasses and tomato-based style. While New York is known for its vibrant food scene, barbecue isn’t likely the first thing to pop into people’s minds when thinking of New York foods. The most outrage stemmed from the picture that accompanied the story. Any barbecue fan would throw a fit if this plate was placed in front of them. Two half-smushed Hawaiian rolls (likely straight from the bag), a mason jar of dark beer, two tiny pickles and a handful of the most unappetizing brisket thrown on the plate. It wasn’t long before #BrooklynBBQ began trending on Twitter and for all the wrong reasons. To be fair, ‘Brooklyn style’ barbecue doesn’t really exist and the point of the article, which was written in 2014, was to highlight the fact that the style that Fette Sau used was being copied around the world. It never says that one style of barbecue is better than another. Barbecue is the lifeblood of the South, especially in North Carolina. In fact, there are many different styles of barbecue throughout the state, from the whole-hog style to vinegar style. Allen & Son BBQ in Pittsboro has been around for nearly 20 years, serving Eastern style chopped BBQ. They also know that an important piece to any barbecue plate isn’t always the meat, but the sides as well. 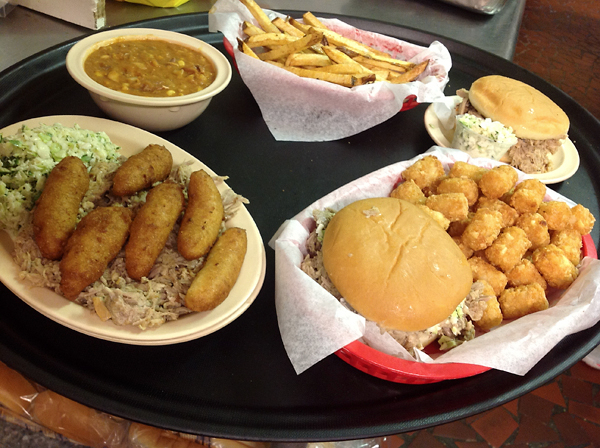 The restaurant specializes in golden-brown hush puppies and homemade coleslaw to complement the barbecue. Let’s compare Munchies’ barbecue plate with a plate served at Allen & Son. This is what real barbecue looks like. Via allenandsonbbq.com. So is Brooklyn barbecue taking over the world?